"Out of the same mouth come praise and cursing. My brothers,this should not be." Happy November, friends! I am so excited to start this holiday season! Aren't you? As we close out the book of Acts, I find myself missing Paul. I think about him often. His life and his preaching affected this heart of mine over 2000 years after he walked this Earth. Paul is one of the ones that I cannot wait to meet in heaven. I have so many questions for him! So many things I need to talk to him about. Hopefully there will be a 24 hour coffee shop open where he and I can chat...for hours. Only God working through Paul could make THAT kind of impact on our hearts. Paul was doing God's work. God's work expands beyond time. The words of Paul inspired by God continue to make HUGE dividends for the Kingdom of God. Aren't we so thankful? Today we begin the book of James. This book is only 5 chapters long. However, these 5 chapters pack a mighty punch. My bible is filled with highlighter marks and circles just for this one little itty bitty book. Here's what I want us to do. Read each day in James. When we finish. Read it again. And again. Until the end of this month. In fact, I want us to know it so well that we almost have it memorized. Did I just hear you gasp? Or maybe that was me. My prayer is that God will speak to us daily through this book. My prayer is also that we will be changed after reading this book. I want this book inscribed onto our hearts for eternity. 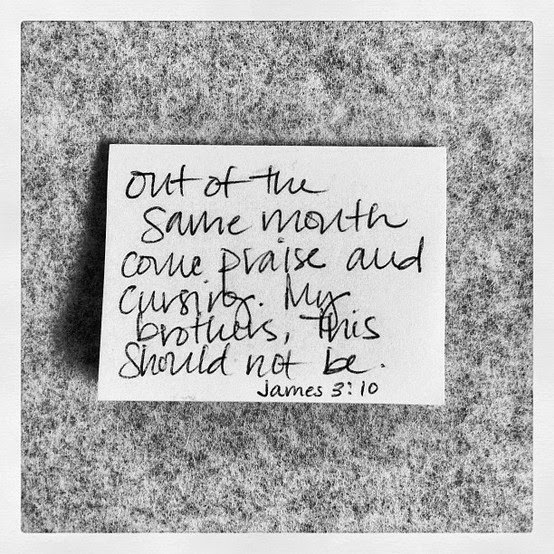 I want us to be able to breathe out the book of James when all is said and done. Father, teach us what You desire us to know from the book of James. There are treasures upon treasures in this small book of Your Word. Help us to uncover these treasures day by day. Help us to live out the words You have for us in this book. Thank You, Heavenly Father. Amen.